Ike and I would like to wish everyone a very Merry Christmas, Happy Hanukkah, Happy Kwanzaa, a God Jul, Feliz Navidad, a Happy Festivus (for you Seinfeld fans), and Happy Holidays! Whatever holiday you and your family celebrate, may your time together be joyous and memorable. May you laugh until your cheeks and sides hurt, eat plenty of delectable food, and sip on delicious beverages. Ike says to remember your equine friends when you are shopping. 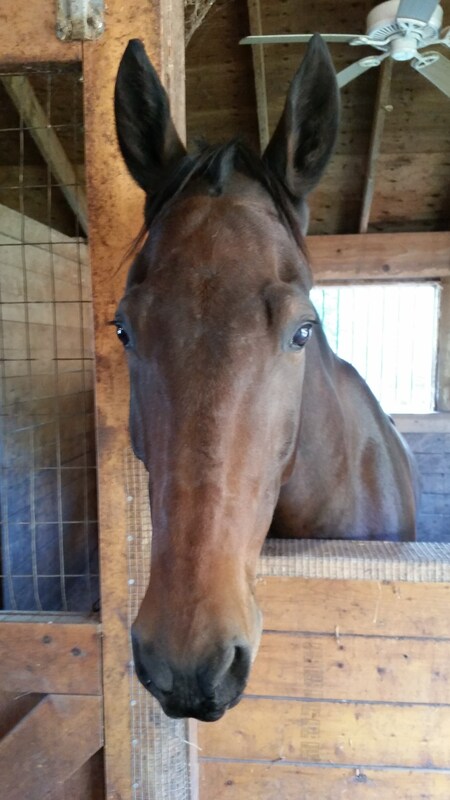 Black licorice, apples and peppermints are particularly tasty. Uncle Jimmy’s Hanging Snacks are also perennial favorites with Ike and Cigar. Cigar will be sporting a new red halter to replace the one Ike shredded. Ike will look dapper in his new burgundy polo wraps. The boys also sent a holiday donation to an equine charity. 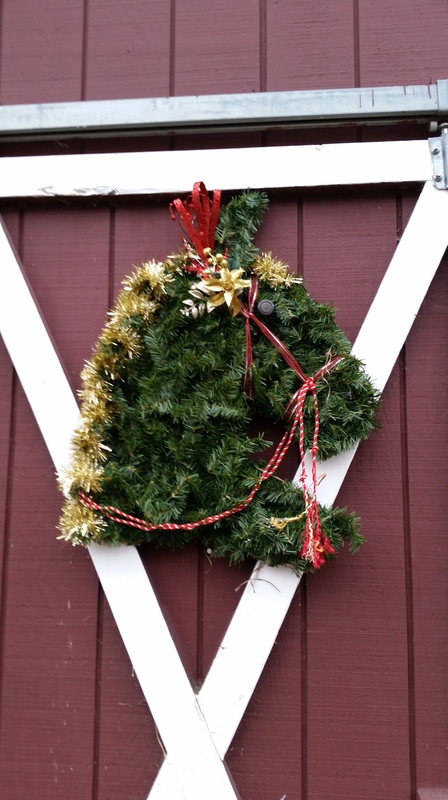 May your year to come be filled with straight centerlines, clear rounds, optimal times and plenty of barn time! I have practiced yoga for over 12 years now. I remember struggling with even doing plank pose; and the thought of mastering scorpion pose, crow pose, or half moon pose seemed a pipe dream. Yet now, I can perform all of those poses without a second thought. As Baron Baptiste tells you on one of his DVDs, “Start where you are and from there you will progress.” I try to remember those words as I struggle with mastering the skills necessary to progress to Second Level. You have to start somewhere and if you never start, you will never progress. The thought of Second Level is daunting. For more accomplished riders, they are probably thinking, “What is the big deal?” I am thinking “Yikes! This is where the crap hits the fan!” No more posting the trot, no more big circles or bee bopping around on half speed. You need to be fully present during every stride – much like you need to be fully present when attempting scorpion pose. I have spent some time checking out the new 2015 dressage tests for Second Level. There is A LOT of work to be done this winter. Well, let’s be honest, we might need spring and some of summer to get into Second Level show shape. I’ve broken down the tests and decided these are the key items for Ike and I to master. Sitting Trot – This one is all on me. I still tilt my pelvis in the wrong direction. I still stiffen rather than relaxing. I still lean either too far forward or too far back. When I lean back and brace in my stirrups, I look like I’m water skiing. (This is as close as I’ve ever come to actually water skiing.) People say, “strengthen your core.” My core is strong, but yet I still struggle to find the sweet spot. Medium Trot – This fall at the regional championships, we received a 6 for our trot lengthening with the comment “Conservative.” I could not argue with the score or the comment. If I tried to push for more, poor Ike would get unbalanced and we’d get scores of 5. It was better to be conservative. I am happy to say that our trot lengthenings are coming along. They are not quite medium trots yet, but I am hopeful that they will be there come spring…of course, I still have to figure out how to sit that medium trot. Counter canter. Still our nemesis. The shallow canter loop of the First Level Test 3 test is about the extent of our counter canter success. A full three loop serpentine? No way. Even just riding the short end of the arena in counter canter is a crap shoot. I have to over ride and over emphasize the counter bend and yet the boy can still throw in a flying change. All we can do is keep trying. Simple Transitions. Slowly, but surely, we are progressing with our simple transitions. Our walk-to-canter transitions are better than our canter-to-walk transitions. The down transitions are better when we train in our double bridle; not at all surprising. Ike still needs a few trot strides before the walk when we work in our snaffle. I am still pleased with where we are. As if the above isn’t enough…we also have…. Shoulder in and Travers. If I had to pick Ike’s stronger movements, I would say it is his lateral work. How could it not be with those long legs? As long as I set him up for success, both shoulder in and travers are going well. At least we have two strong points in our quest for Second Level success. Rein back. Rein back is one of Ike’s favorite movements when evading my aids for turn on the forehand and turn on the haunches. Unfortunately, he also likes to duck behind vertical and give me more than the required number of steps. Our work is currently on hiatus as I fight the flu. Have no fear. Ike and I will be back to work before you know it. What is a Horse Junkie To Do When Illness and Weather Keep Her Indoors? This has been a challenging week for me. Not only has the weather been less than stellar, I also managed to contract some early season snot-germ that kept me at home. My coworkers even told me to get out when I went to the office. 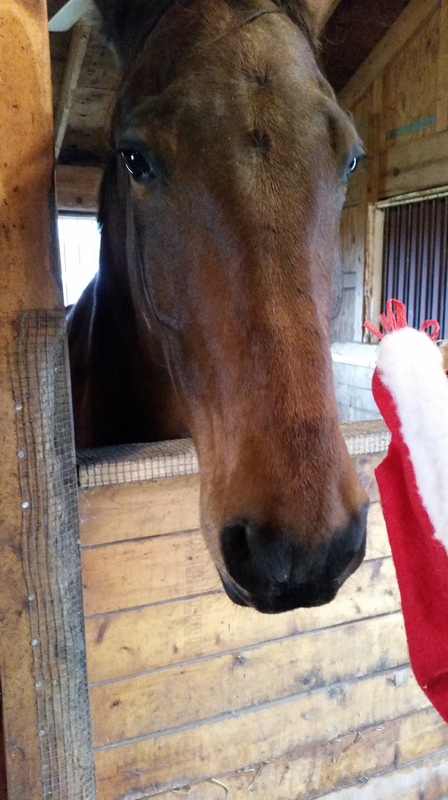 Bad Weather + Bad Cold – Riding – Barn Visits = Stir-crazy horse owner. Rumor has it that Ike is less than concerned about our lack of work this week. He has enjoyed his unexpected vacation by romping with his brother. 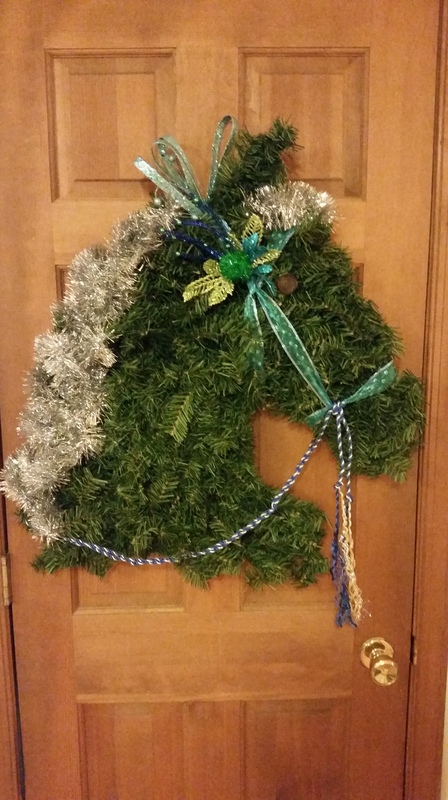 Before the cursed germs invaded my body, I had decided that I was going to get crafty this Christmas and make my own horse head wreath. I found the instructions on Facebook, and I thought to myself that I could give it a go. If you search around the internet, you can find plenty of them made by very talented people. Some are made with real greens, others with garland purchased from the craft store. All of them are pricey. 1) Use the cheap wire hangers that you get from the drycleaners. 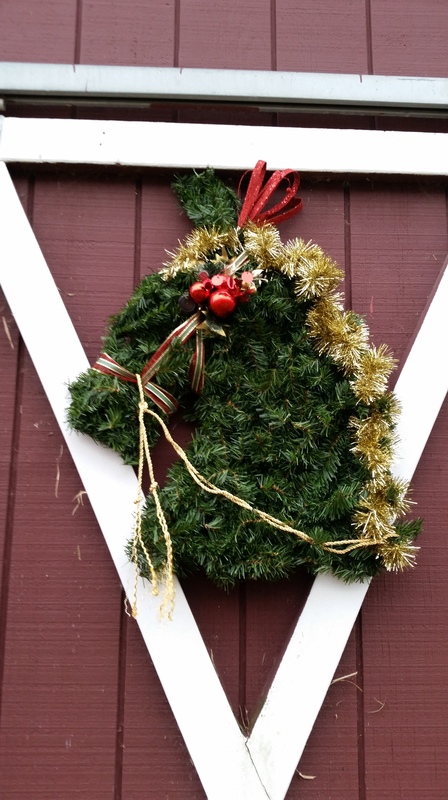 I made my wreath with these cheaper ones and the wire was very easy to shape. When I decided to make 2 horse heads for Ms. C, I used purchased wire hangers from Walmart. The wire is a thicker gage from the purchased hangers, and let’s just say that it was not as user friendly for bending. My husband grew concerned about my well being as the nasal-toned cursing grew louder and louder. 2) Purchase wire cutters. Kitchen shears, school-kid scissors, and wire-strippers are all poor substitutes and will also lead to cursing. 3) The instructions I had said to use masking tape and hot glue for the frame. Hot glue guns and I are not on speaking terms, so for Ms. C’s wreaths that needed to be outdoor friendly, I used green duct tape. Duct tape, like baling twine, can fix anything. 4) Read the label of your ribbon while at the store. Finding out 10 days later that your spool doesn’t have enough ribbon to complete the bridle causes a delay in the completion until you can return to the store to buy more. 5) When using craft glue to add embellishments to your picks, do not set them on the carpet to dry….you will have to cut them away from the carpet and then cut glue blobs off your pick. Glue blobs are not very festive. 6) If you are sick, consider delaying your craft project. The holiday ribbons and picks all have glitter. The glitter gets everywhere. A snotty, glittery red nose is not a good holiday look. It is not a good look period. Good luck if you give it a try. Please share photos in the comments!